Of all the reasons that people choose to travel on cruise ships, the chance to explore the world while luxuriating in fantastic onboard facilities has got to be up there. Indeed, the thought of sailing to some of the most thrilling destinations on the planet, while sipping on a glass of premium wine or an exotic-tasting cocktail in an elegant bar, is something that never fails to excite. The chance to sample some of the local delicacies in the destinations on your itinerary is a major attraction of any cruise holiday, and this applies as much to drinks as it does to food. The sheer number of variations, in terms of boozy beverages found around the world, is truly staggering. Here's a look at a few of the best cocktails around the world, to look out for on your travels. Consisting of rum, mint leaves, lime, and crushed ice, the mojito is the king of cocktails in Cuba. It was famously Ernest Hemingway’s drink of choice while he was in residence here, but remains arguably the most popular cocktail among tourists and locals alike. Translating to ‘strained pineapple’, unsurprisingly this cocktail - which is thought to have originated in Puerto Rico – is made with fresh pineapple juice, coconut cream, and rum. The ingredients are typically shaken or blended, and served with ice. Islands all over the Caribbean serve their own take on rum punch, but our favourite is the original, Bajan kind. This is generally made with rum, lime juice, sugar syrup, bitters, and spices such as cinnamon or nutmeg - but other ingredients might be added. The history of the US is written into many of the country's most famous cocktails, so drinking a few of these while visiting the country is a fantastic way to experience the true spirit of America. Made with whiskey, bitters, sugar, and orange peel, the origins of the Old Fashioned are in dispute. An early record of the name being coined dates back to 1881, in a gentlemen’s club in Louisville, Kentucky. The Long Island iced tea dates back to the days of prohibition, when residents of the east coast created a cocktail that looked exactly like an innocent glass of chilled tea. In fact, it contains vodka, gin, rum, tequila, and triple sec, and is topped with a dash of cola. Visitors to New York may want to sample the drink which shares its name with one of the districts – Manhattan. Consisting of dry vermouth and Maraschino liqueur, it is believed to have first been served in the 1870s, at a banquet in honour of US presidential candidate Samuel J Tilden. Europe is often associated with wine and beer, but there are in fact a number of tasty cocktails that can be traced back to this part of the world – which are now found on bar menus all over the globe. This delicious and refreshing cocktail was first invented in Venice, Italy, by the founder of Harry’s Bar – Giuseppe Capriani. It is made with prosecco, and peach puree or juice, and is popular all over the world. Synonymous with Spain, Sangria is found all over the globe, especially during the summer months. It’s made with red wine, orange juice, lemonade, ice, and optional fresh orange and mint. Contrary to its name, the White Russian actually came from a Belgian bartender – Gustave Tops – in 1949. It is made with vodka, coffee liqueur, and fresh pouring cream, and didn’t truly gain fame until 1998 when it was largely featured in the hit film – The Big Lebowski. 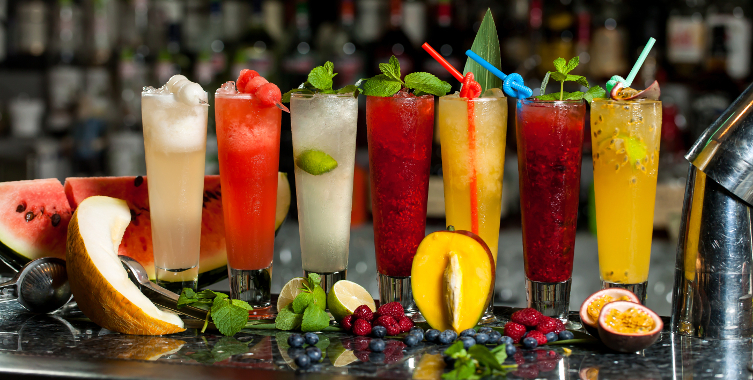 Those cruising to the beautiful and exciting shores of Asia will be able to sample some uniquely exotic flavours in the form of sweet and tasty cocktails. Made with gin, cherry liqueur and pineapple juice, this drink is believed to have been invented in 1915, by a bar tender at the world-renowned Raffles Hotel; one of the most iconic establishments in Singapore. It’s no secret that there is quite a drinking-culture among tourists in Bangkok, and so it’s inevitable that the capital city’s barman should create some signature cocktails. Our favourite is the Bangkok Breeze, made with white rum and ginger ale, and served with a lemon slice. Sake – or rice wine - is a traditional drink in Japan, which is enjoyed all over the country. It has been used as the base ingredient for many cocktails – including the Saketini, which is essentially sake and dry gin, served with an optional onion or olive. Please remember to drink responsibly when enjoying cocktails or other alcoholic beverages.